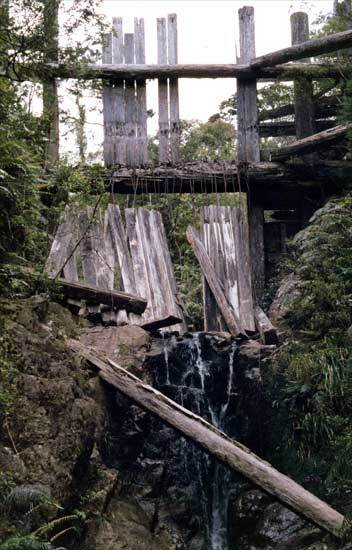 This collapsing kauri dam was built by Joan Tollenaar’s Irish ancestor, John Patton, at Puketui on the Tairua River, Coromandel. In the 1980s Joan and her husband visited the dam, and did more than a short bush walk. Contributed by Joan Tollenaar of Warkworth. I am an old woman now, but about 25 years ago I had a bush adventure which still makes me smile. While holidaying at Pāuanui my husband and I decided to look for the kauri dam built by my ancestor, John Patton, in the hills beside the Tairua River. We had a hand-drawn sketch map, so we set off early. Of course, it was all uphill and pretty steep for city dwellers. Going was slow amongst the tea tree, hissing with cicadas. The trail was very vague, but after fording streams and crossing gullies – hooray, there was the dam. The atmosphere under the trees was damp and chill beside the stream. The dam was dilapidated, but fascinating. We thought about the amount of work required to build it with the equipment they had more than a hundred years ago. After a couple of hours exploring the area, and a late lunch, we set off for the return. I knew we could do a round trip instead of going back the same way, so we took the track in the opposite direction. After a while, it seemed to peter out, but I knew if we followed the stream we would come to the river. The light was fading rapidly under the bush canopy, and it seemed quite dangerous to keep stumbling through the deep litter of roots and fallen branches. A broken leg or sprained ankle would not be good, so with a rush, my husband cut ponga fronds to lie on and as a bit of cover. By then it was pretty dark, though not late. We had biscuits and cheese to eat, our sweaters and parkas from the morning and a couple of pairs of spare socks. I wore longs, but my husband wore shorts – and the mosquitoes were fierce! He wrapped a newspaper around his legs and we put socks on our hands. We slept a little, but in the early hours my husband started to shiver, so I sat behind him, wrapping my arms around him and putting my legs alongside his, to give him my body warmth. As soon as it was light we continued down the stream, and in less than half an hour were at the river. It was deepish, as we could tell by the cows crossing with water up to their bellies, but a man on a farm bike came to our aid and ferried us across after I called out to him. We shambled wearily down the road to our car, back to the holiday house and fell into bed. Shower and breakfast had to wait till we caught up with sleep. We had come to no harm, not even a cold, though with sore thigh muscles I was walking like a cowboy for a while.